At a crossroads in his life, Lipsha Morrissey is summoned by his grandmother on the reservation. There, he comes to terms with his heritage, his future, and his first true love in this novel of spiritual death, lyrical prose, and wild hope: the latest and most luminous work in the series begun with Love Medicine. This is the story that tells of the growth and maturation of Lipshaw Morrisey. Lipshaw, illegitimate son of June Kashpaw and Gary Nanapush, is summoned back to the reservatio by his grandmother, Lulu Lamartine. The method of summons is by sending him a wanted poster with his father's photo on it. This wake up call causes Lipshaw to examine his life. He lookw at his world of drugs, his dead end job and bleak future. Then he packs his car and heads back to the reservation. When Lipshaw was a child, we learn that "...spirits pulled his fingers." Big things were expected from him. He finished high school and scored well on the North Dakota college tests but became another reservation statistic. When he returns, he takes a job as a night watchman at the Bingo Palace. He sees Shawnee Ray and falls in love with her. However, she is also being sought after by Lipshaw's boss, his uncle Lamar Lamartine. 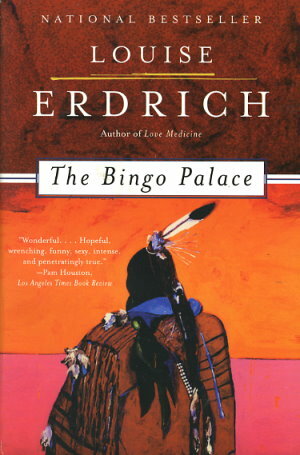 Erdrich's writing is rich with description and imagery. When Lipshaw and Shawnee Ray are with friends, she asks if he wants to kiss her. His answer, "Not here, out first kiss has to be a magic moment only we can share." The author possesses a talent for creating characters who have an individuality that makes the reader want to learn more of their lives. With Lipshaw, we see his early promise but like many members of the Chippewa Nation, he seems content with a meager existence. He gets by from his wages as a night watchman and his bingo winnings. There are streams of hope in Shawnee Ray's future goals but we learn that many goals are just derams that fade away in the mist.